By heraldic tradition, the arms of the bishop or "ordinary" of a diocese are joined to the arms of his jurisdiction, seen in the left side of the shield. The Coat of Arms of the Diocese of Laredo captures the rich history of the Church in South Texas. The colors and symbols represent a diocese that treasures its history and looks joyfully to its future. Across the field, descending from upper left to lower right, is a wavy silver bar representing the Río Grande. The chief geographic characteristic of the area is additionally emblematic of the waters of Baptism, the River of Life, through which we are incorporated into the People of God, the Church. In the upper right of the design is the silver steeple of San Agustín Cathedral in Laredo. The depiction of the steeple of San Agustín gives special prominence to San Agustín Cathedral as the "mother church" in this South Texas region. In 1755, Spanish friars who accompanied Don Tomás Sánchez, the founder of Laredo, established the church of San Agustín near the banks of the Río Grande. San Agustín Cathedral is the second oldest church in South Texas and one of the oldest in the south western United States. The Diocese of Laredo is placed under the patronage of St. Agustín of Hippo. The field of the coat of arms is red, symbolizing the Holy Spirit. Having been formally erected as a diocese during the Great Jubilee Year 2000, the red field indicates a new beginning in the life of the Church in this region of South Texas. As the apostles were associated with the Holy Spirit in a very special way, the people of the Diocese of Laredo are invited to draw near to the Holy Spirit, the Spirit of Life, and renew their commitment to spread the Good News to the "ends of the earth." 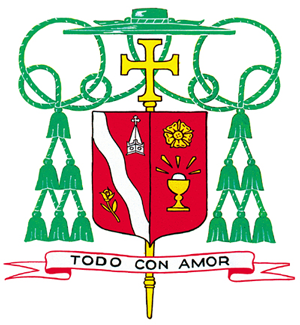 For his personal arms, seen in the right side of the shield, His Excellency, Bishop James A. Tamayo, has retained the design that was adopted at the time he received the fullness of Christ's priesthood, as a bishop, as he was ordained and appointed Auxiliary Bishop of the Diocese of Galveston-Houston. The field of the Bishop's personal arms is red and on this field are displayed a conjoined chalice and host and a gold rose. The gold chalice with its issuant silver host represents the central and most important event in a priest's existence: the celebration of mass, in which the ordinary elements of bread and wine, by the action of God Himself, are turned into the Body and Blood of Christ. The Sacred Species radiate grace to all, as represented by the golden rays coming forth from the Host. These charges are all placed below a golden rose, looking into the blossom, and it is in reflecting on this beauty of nature that we glimpse what grace within one's soul must be like. As the rose radiates beauty, so we must radiate the grace of Christ that we have within. The entire design is rendered in red and gold, traditional Hispanic colors, to honor the heritage that His Excellency received from his parents, Antonio and María Guadalupe Tamayo. For his motto, Bishop Tamayo has chosen "TODO CON AMOR." This phrase is a translation of one made popular by Pope John XXIII at the time of the Second Vatican Council. In this phrase the Holy Father admonished the Council Fathers to keep in mind that in everything they did, or would do, as Christ had instructed them, they should do it "ALL WITH LOVE." This phrase, then, expresses Bishop Tamayo's deep belief that all of us should live lives in which we truly do "all with love." The device is completed with the external ornaments which are a gold Episcopal processional cross, which is placed in back of the shield and which extends above and below the shield, and a pontifical hat, called a "gallero," with its six tassels, in three rows, on either side of the shield, all in green. These are the heraldic insignia of a prelate of the rank of bishop, by instruction of the Holy See, March 31, 1969.